We run a Sunday meeting on the 2nd 3rd and 4th Sunday of most months. Please check our dates page for details. Our Sunday services are very relaxed and we are happy to have folk of all disabilities and none. We meet in the scout hall, at the back of Sainsbury´s. (See map below.) 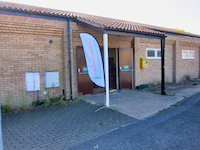 It has excellent wheelchair access to the hall, but wheelchairs cannot get into the toilets. We do not have a loop induction at the moment, but would purchase one if necessary. We try drama and dance. We help and encourage everyone to get involved in some way or other. We encourage folk to use flags and percussion instruments as their way of worshipping. We meet in the Scout Hall behind Sainsbury's Supermarket in March. We run groups in 5 residential homes throughout the area.